It’s always good to prepare a few projects to have on hand if young ones are going to be your guests over the holiday season. Younger children, 2 1/2 – 6 years, will find this project easy and satisfying. The materials are easy to gather, cut into strips, and store until needed. The creation of the tree is pretty much self-explanatory. All you need to do is follow the lead of the photographs. * A background piece of paper at least 8.5 x 11 inches. * Small colorful foam stickers with sticky backing. Colorful magazine strips can also be used. 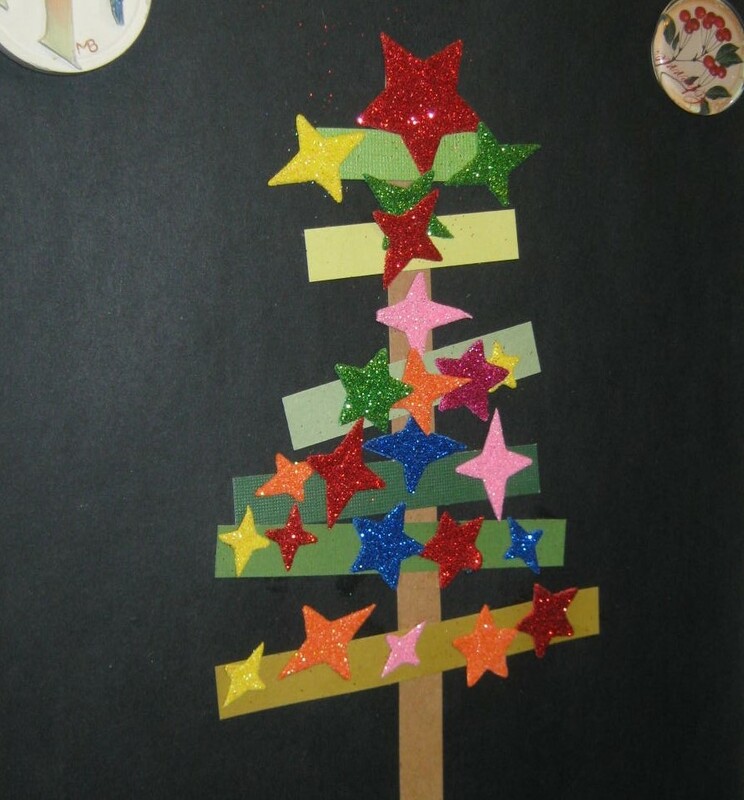 Light items that are bright, shiny or glittery, can be glued down and will work as ornaments. (Buttons, beads, glitter) Have Fun! My three-year old grandson was proud of what he created! There’s nothing cuter than chubby little toddler hands, busy at creating something fun and inexpensive, that adds sparkle to their day! Great grandmother grandson memories created right there. Do you have grand daughters too ? Susie, I have five grandchildren, and being a grandmother is everything I ever hoped it would be…pure joy.